Nominated for Best Costume Design (Eiko Ishioka). Lately a lot of fairytale remakes have been surfacing. The summer of 2012 saw two different takes on Snow White. Snow White and the Huntsman took a darker approach with impressive special effects and love triangles. 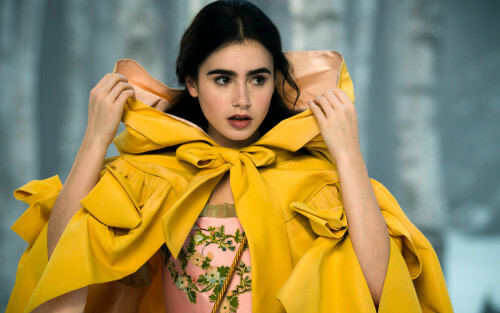 Mirror Mirror is a comedy first, excellent display of costuming second, and pretty okay movie all around. It was a corny, good kid friendly movie and my inner child really enjoyed it. If you are unfamiliar with the story of Snow White, know that the film follows the basic plot line with some stabs at originality. The Queen (Julia Roberts) married the King (Sean Bean), who promptly disappears, leaving behind his beautiful daughter named Snow White (Lily Collins) who is abused by the jealous, youth obsessed Queen. She meets a Prince Alcott (Armie Hammer) but is chased from the kingdom by the Queen who wants her dead. She comes upon seven dwarves, who are not named things like Grumpy, Dopey, and Doc in this version, and joins them after some resistance on their part. There are other unique aspects of the film, but the biggest is the comedy. There is a cute, although fairly childish bit in which the Queen accidentally switches a love potion with a puppy love potion and the Prince’s affections for her become something other than what she wished for. The dwarves are also outcasts who enjoy robbing people instead of mining and Snow White learns some moves while she stays with them. 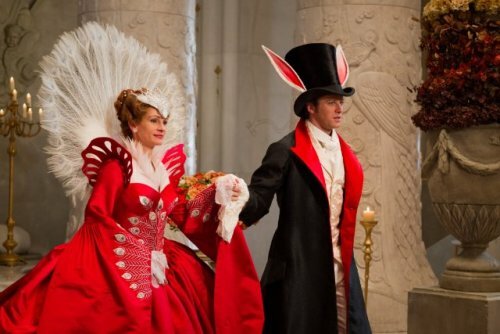 The costumes are clearly a highlight of the film. Both original and mostly colorful, I really enjoyed their unique flavor. The whole film seeks to add new spins on a classic story. The dark forrest, the village of the kingdom, the court life, everything in-between has an unrealistic quality that adds to the charm of the storyline. To be quite honest, the film isn’t a knock-out artistically, or even technically, but it was certainly entertaining and fun. Roberts is definitely a standout as the Queen. Her brand of crazy is more comical and magical. She undergoes ridiculous beauty treatments and her “mirror on the wall” is certainly depicted differently than one might expect. The romance is sappy, the plot is predictable, and the roles seem less than challenging, but as a whole the fun and colors won me over and Mirror Mirror is probably going to become one of my guilty pleasures. I would definitely recommend this film if you have kids or if you are a Julia Roberts fan. I had no desire to see the film from the marketing, but upon seeing it I truly enjoyed it. If you have the time, it might be worth a watch if you can stomach the cutesy execution.